For the adventurous at heart (or adventurous at taste), nothing compares to the adrenaline rush of a perfectly grown, beautifully prepared pepper. In addition to gracing some of our favorite dishes, hot peppers can improve circulation, increase metabolic rate, and boost dopamine. Of course, when it comes to crowning the hottest pepper on earth, every corner of the globe seems to have something special to offer, which is why we’ve taken the liberty of seeking out the 10 hottest peppers in the world. The “heat” of peppers is determined using the Scoville scale or Scoville heat units (SHU), which measures the degree of dilution you would need to no longer taste the spice. For some context, Tabasco (at its spiciest) comes in at about 5000 SHU. Also, note that spiciness can vary from pepper to pepper depending on factors like size. 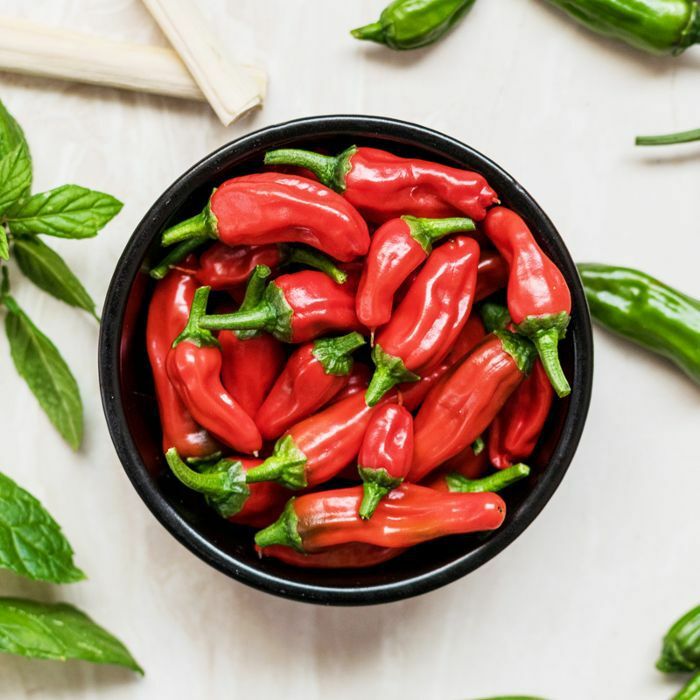 Whether you’re looking for your next culinary challenge or a list of extremely spicy foods to steer clear of, keep reading to learn more about the 10 hottest peppers in the world. Like a few of the peppers on this list, the 7-Pot Red Giant hails from a strain of ultra-hot peppers native to Trinidad. The “7 Pot” nomenclature was given due to the pepper purportedly being hot enough to spice up seven pots of stew. This pepper comes in at 1,000,000 SHU. Also known as Bhut Jolokia, the Ghost Pepper is a vicious contender among the hottest peppers in the world. Known for its smoky heat, it’s become a trendy pick as a cooking spice and for alcohol infusions. The Ghost Pepper measures about 1,000,000 SHU. At just over 1,100,000 SHU, Rusalka’s Revenge is a lesser known but wickedly spicy top pick among the hottest peppers in the world. Another memorable member of the 7-Pot clan, the Primo variant isn’t just insanely hot at 1,268,250 SHU—it also has a daunting, distinctively sharp “stinger” at its base. Even if you’re not familiar with the Scoville scale, 1,300,000 SHU should sound like a lot. The hottest picks of this pepper boast no fewer. This one is also of Trinidadian origin. The Naga Viper clocks in at 1,349,000 SHU, and true to its name, it definitely has a bite. This hot pepper hails from the UK, making it one of the few world’s hottest peppers to have been developed in Europe. It was even briefly named the hottest chili in the world in 2011. At a whopping 1,463,700 SHU, the Butch T held the world record for hottest pepper on earth in 2012, taking the crown from the Naga Viper. This pepper comes from Australia, where it was created by the eponymous Butch Taylor. Known for its unique burgundy tone, the 7-Pot Douglah is the hottest of the famed 7-Pot strain, measuring up to 1,853,986 SHU. Also of Trinidadian origin, this hot pepper is enjoyed in a variety of cooking traditions—both powdered and infused. Less than 200,000 SHU shy of the world record, the Moruga Scorpion is handily one of the hottest peppers in the world at 2,000,000 SHU. It’s also a notable native from the islands of Trinidad and Tobago. At 2,200,000 SHU, this pepper is officially the hottest pepper in the world according to Guinness World Records. The Carolina Reaper was initially developed as a cross between the Red Habanero and Pakistani Naga. As if the bright red exterior wasn’t enough of a warning, this pepper has a distinctive tail at its base that looks like a spear. Now that you know about the hottest peppers in the world, see the healthiest spices to add to your pantry.